2019 is not the year we bend and have a hard time lacing our shoes every time they untie. Nike, the famous footwear brand has unveiled a new set of basketball shoes which lace themselves. Dubbed Nike’s Adapt BB, these shoes are one of the World’s first shoes which the players could lace using their smartphones or through a touch of a button. The shoes feature what the company is calling a ‘power-lace’, which could be set on a number of different settings. The shoes come with a price tag of $350. “Welcome to the future of footwear. Step into a shoe that comes to life when you put it on. It lights up. It senses you. It adjusts to the shape of your foot and activity at the touch of a button – so you always get the perfect fit,” Nike mentioned. The users would be able to switch between the fitness of their shoes through a smartphone like when sprinting, or a bit loose when just resting. The automated lacing mechanism isn’t quite visible as it’s covered with the fabric, however, the company says that it has shifted to a new compressing band mechanism in order to tighten the shoes. 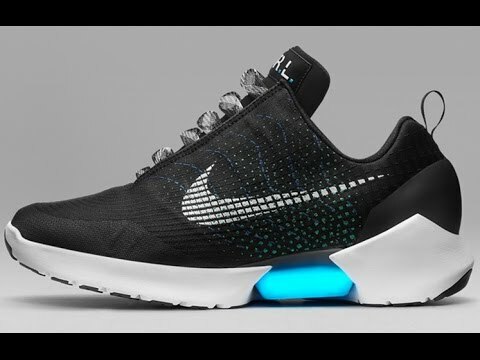 The shoes will have to be wirelessly charged and will even receive updates. The users will also be able to choose what colors they want on their shoes using the application. “Pair your shoes with the Nike Adapt app to fine-tune your fit, switch between presets, customize the lights, check battery levels and more – all from your smartphone.” The application would soon be released by the footwear company.